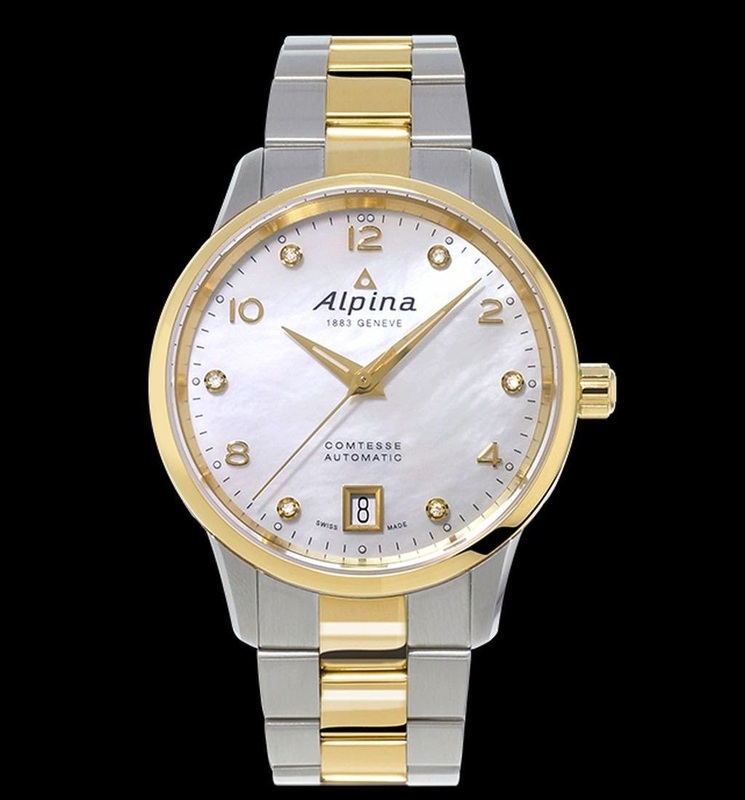 In 1963, Swiss watch maker Alpina first launched its COMTESSE lady collection with automatic movements. 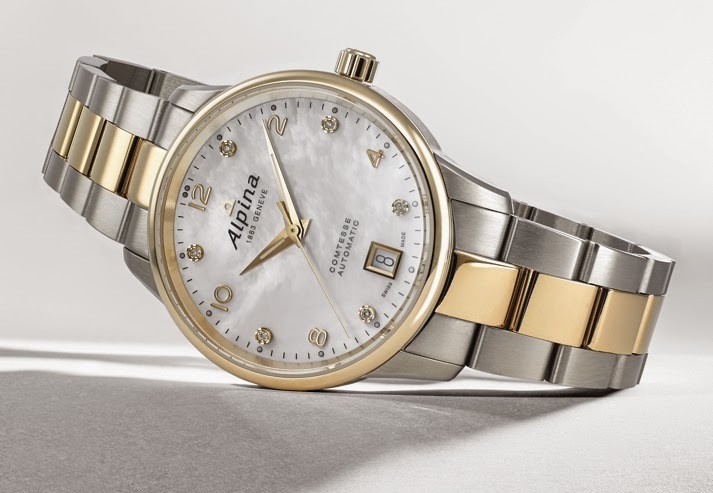 In 2014 Alpina brings back its COMTESSE lady line to mark its long tradition in the design of fine lady watches, which has started in the 1920’s. 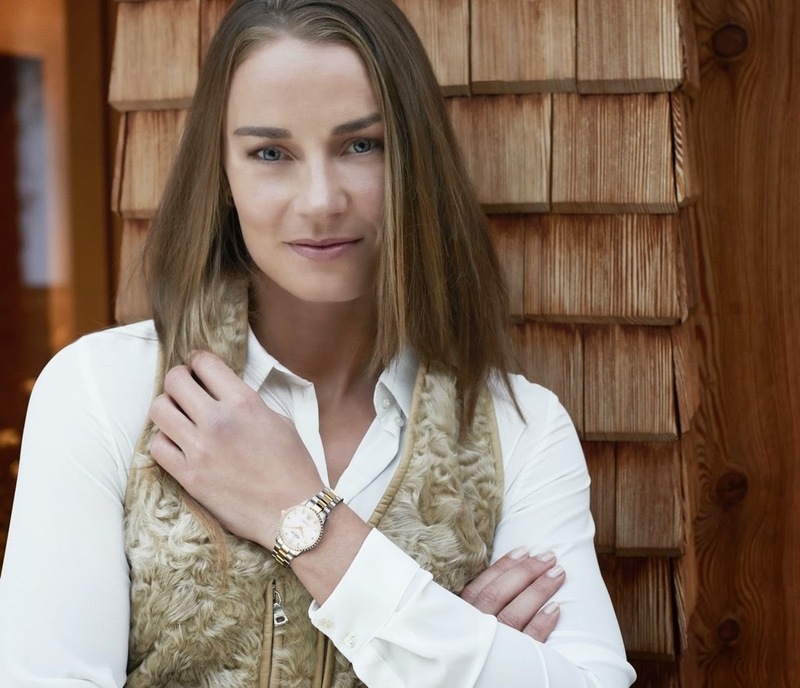 The Ambassadress for the ALPINA COMTESSE Collection is TINA MAZE, double Olympic ski champion in Sochi. 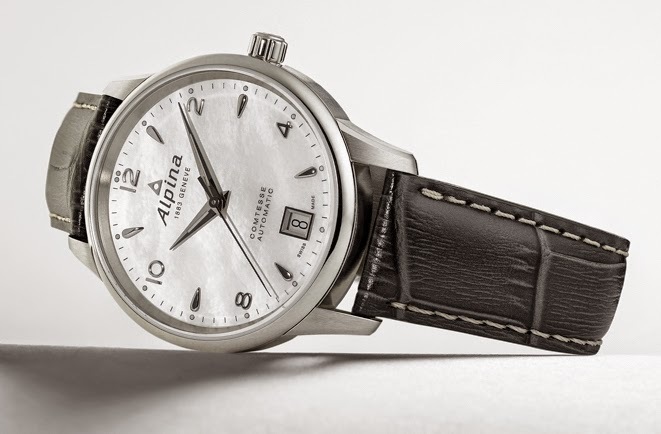 The new range of Alpina COMTESSE watches is a delightful balance of sportiness and elegance. The COMTESSE line embodies the concept of Swiss Alpine Chic to the fullest: Swissness, Character, Luxury and Simplicity. 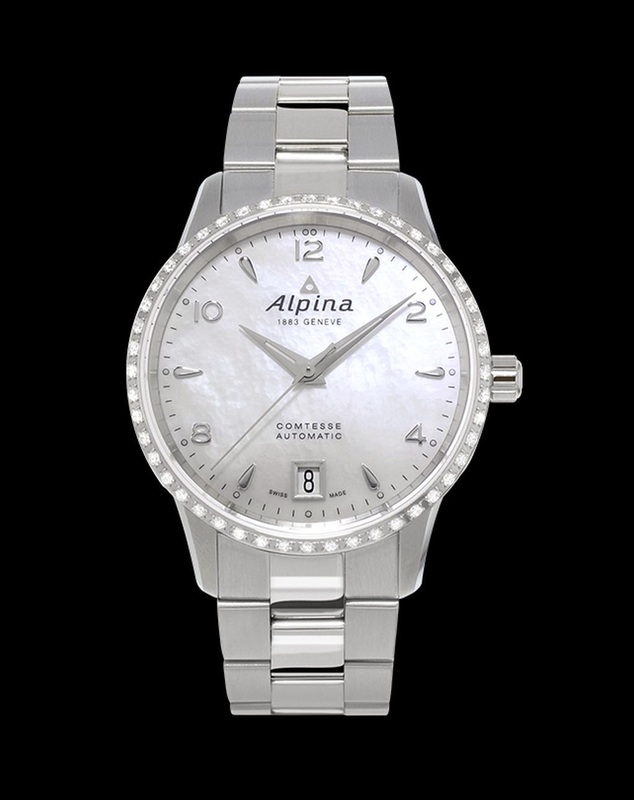 Simple but assertive lines and a sporty 3 links bracelet blend with a mother of pearl dial adorned with diamonds or drop shaped indexes and a rounded, polished stainless steel bezel, with or without diamonds. 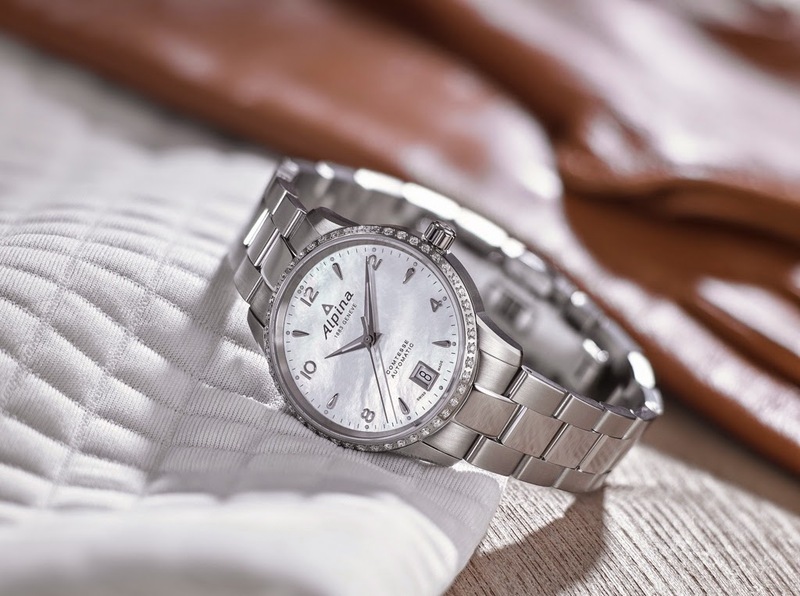 Ladies will love the elegant yet strong presence of this watch, which can accompany any attire and recalls the timeless alpine glamour of the St.Moritz style. The 34mm diameter size perfectly corresponds to today’s fashion and the automatic movement ads the mechanical dimension, which is a must for a luxury lady sport chic timepiece. 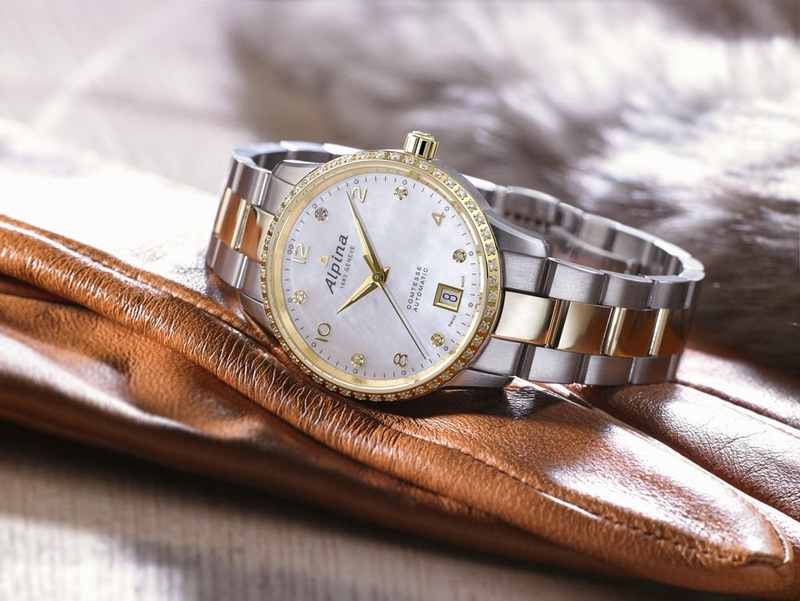 Identical to the stainless steel in terms of movement features and water-resistance, the two-tone versions feature a diamonds bezel execution with 48 diamonds set on a gold plated bezel with a mother or pearl dial with 6 diamonds; and a yellow PVD bezel version with 6 diamonds on the mother of pearl dial. Both versions have a stainless steel metal bracelet with a yellow PVD central link. The COMTESSE in stainless steel encases an AL-525 automatic mechanical movement with 26 jewels and a power reserve of 38 hours; and is water-resistant up to 5ATM (50m, 150ft). It comes in two versions, with or without 48 diamonds on the bezel, and features a mother of pearl dial and luminous dots enhancing its drop shaped indexes and assuring readability at night. The stainless steel version comes with a choice of a grey genuine leather strap or a stainless steel bracelet.